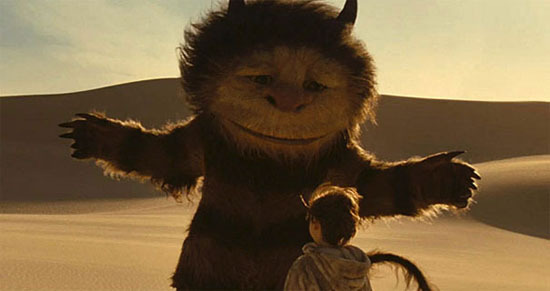 It's been in the can for some time but the wait is over, Spike Jonze interpretation of the classic children's book "Where The Wild Things Are" has hit the big screen and it's clear to see why Warner Bros. execs had concerns over Jonze's take. Spike Jonze is known for being an artiste; a director that doesn't necessarily make commercial films and he proves it again here. From the moment we meet Max, running around the house like a wild animal, we know this is not your average Hollywood flick; the title treatment alone is straight out of a film you would see at the Enzian. Playing the role of Max is the aptly-named Max Records who does a very solid job of embodying what we expect Max to be; at least what we can glean from the nine sentences found in the original book. After a rough night at home with his divorced mother (Catherine Keener), Max runs off to make his way to the island of the 'Wild Things'. And this is what Jonze gets right, the island locale is spectacular; it feels like the feral place it needs to be for the film to succeed. And speaking of feral, the 'Wild Things' are just that; the choice to use tangible creatures versus pure CGI was essential. From 'Carol' to 'Judith' to 'KW', they look incredible - the facial movements (CGI) make them feel as real as any 9-foot-tall monsters could ever be. One large drawback is the use of recognizable voices for the things, especially 'Carol' who is voiced by James Gandolfini. Having images of Tony Soprano bounce into your mind when you should be investing in the movie and its' characters is a nuisance that is simply unnecessary. Why does Hollywood think that it's paramount to have known actors voice characters? Would "The Lion King" have made another $50M if Tom Cruise voiced Simba's father? It's gotten out of hand (rant over). Where Jonze fails is in creating any emotional attachment to the actual monsters. They wander around as if they need higher doses of Prozac; coming off as depressed but we never truly know why. Are they lonely? Bored? Sexually frustrated? It's hard to pinpoint why they are so melancholic. Max's relationship with the creatures doesn't ever rise to a level that creates the emotional resonance needed for you to truly care about what happens during their adventures. And by the end of Max's stay on the island, the audience is left largely ambivalent about his departure; the exact time that frankly, you should be shedding a tear or two. My first reaction after exiting the theater was this: I would love to hand the same 48-page book to another director, a Peter Jackson, and let him take a crack at it. Something tells me he would create a film a bit more commercial, a bit more kid-friendly and ultimately something that would last through the years and become the classic that Jonze failed to make.